2018 marked the first down year for the U.S. equity market since 2008. The 2009-2017 stretch ties as the longest annual winning streak in market history. Until the fourth quarter, markets were buoyant, but political instability at home and abroad, rising interest rates, and a potential growth slowdown rattled global markets. Other than cash, all asset classes ranged between flat and down. 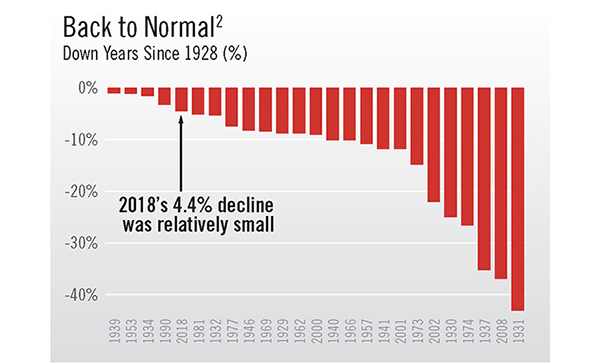 Diversification isn’t “working” right now, yet 2018 was a good reminder of the impossibility of predicting short-term price action, and the need to plan for volatility. Over the long run, a diversified portfolio has produced solid results. Out of 91 calendar years since 1928, 25 were negative. 2018’s volatility was around average. It was 2017’s ultra-smooth market that was anomalous. In Q4, a diversified portfolio of assets declined -8.5%, led by U.S. stocks. The S&P 500 and Russell 2000 Indexes declined -13.5% and -20.2%, respectively. For the year, those markets declined -4.4% and -11.0%. Value stock losses outpaced growth stock losses across the market cap spectrum in 2018. The energy, financials, and industrials sectors posted double digit losses; consumer and technology stocks were about flat during the year. Bonds did not provide much shelter from the storm, nor did REITs or commodities. 2Ned Davis Research. © 2019 Ned Davis Research, Inc. Further distribution prohibited without prior permission. All rights reserved. See NDR disclaimer at www.ndr.com/copyright.html. For data vendor disclaimers refer to www.ndr.com/vendorinfo.